Are certain topics outside of science or do the methods of science apply to all human thought and knowledge? Religion is outside of science. Love and emotional feeling is outside of science. My favorite piece of art, literature or music is outside of science since it depends only on my opinion. All of the above are example of topics that cannot be proved. Therefore they are outside of the limits of science. Some students wanted to see what would happen if you tried to melt ice water with a bunsen burner and then keep heating it until it boiled. Some students thought that since the bunsen burner was not adjusted after lighting that the water would heat up at the same rate of speed. Other students thought it might take a long time to melt the ice or to boil the water. Which of the following statements best represent a hypothesis? The Kinetic Molecular Theory states that the more energy the molecules absorb, the faster they vibrate. The heat lost by the bunsen burner must equal the heat gained by the water and the surroundings. This is due to the Law of Conservation of Energy. Water will not show the same temperature rise per minute as ice is melted and then the water is boiled. Phase changes absorb or release energy so the graph will not be a straight line. There is not enough information to choose a hypothesis. All good science students wait for their teacher to explain what the problem and hypothesis is after the lab is complete. Students working on the experiment in Q2 have decided to measure the temperature every two minutes graph the results. They have chosen the time interval after discussing it amongst themselves. This makes time the_________? Dependent variable which should be plotted on the Y or vertical axis. The independent variable which should be plotted on the Y or vertical axis. The dependent variable which should be plotted on the X or horizontal axis. The independent variable which should be plotted on the X or horizontal axis. To show the results the students were discussing what type of graph to draw. Which student's suggestion should be chosen by the group. Student 1 suggested using a bar graph since they are easy to make. Student 2 suggested a pie chart since pie was their favorite food. Student 3 suggested using a line graph since the data were likely to be continuous. Student 4 suggested not drawing a graph since no one knows how to read them. 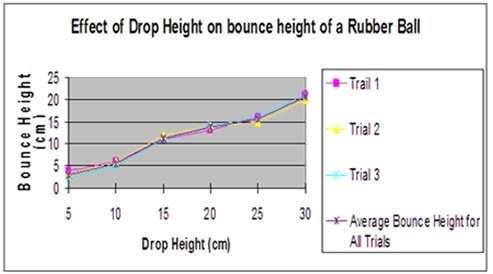 Use the following graph to predict how high a ball dropped 25 cm would bounce. Can't predict the future, even using graphs. Which of the following is not something an honest scientist should ever do? Publish the steps so that others could see if they get similar results. Make up data so that the right answer can be proven to be true. To a scientist a model can be many things. Which of the following is not an example of a scientific model? A carefully painted 55 Chevy Nomad with no messy glueing. An illustration of something seen under a microscope. Which statement BEST illustrates a classification system? A glacier melts at the rate of one meter per year. Ocean depths are measured by using sonar. Snowfall predictions for winter storms vary. Stars are grouped according to their color. Which property was most likely used to classify the substances below?